With daily service to San Diego, Orange County, Los Angeles, Ventura, Santa Barbara and San Luis Obispo, the Pacific Surfliner can take you on a scenic ride to some amazing destinations. Plan ahead to help avoid crowds, and make the most of your trip with these tips. Pacific Surfliner trains offer two types of tickets: Unreserved Coach and Business Class. 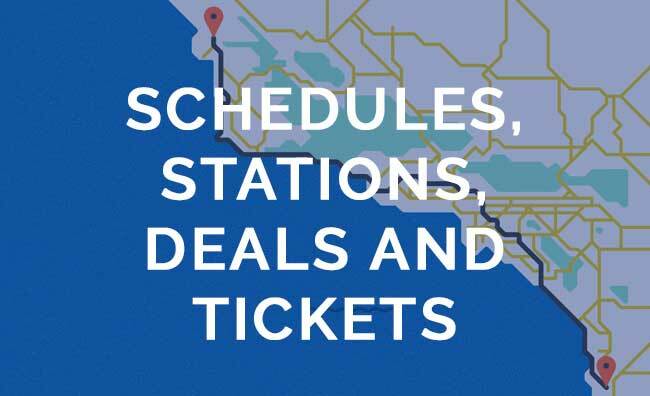 Unreserved coach tickets allow you to ride any Pacific Surfliner train from the origin station to the destination station listed on your ticket. This gives you the flexibility to take a different train than the one you selected in the booking process if your travel plans change, subject to certain restrictions. Because Unreserved Coach seats are available to boarding passengers on a first-come, first-served basis, trains can occasionally become crowded, especially in the summer and during peak travel periods. On the busiest trains, it may become difficult to find a seat on certain sections of the route. Fridays and Sundays are typically the busiest travel days on the Pacific Surfliner, especially on the 700-series trains between Los Angeles and San Diego. Consider choosing one of the 500-series trains instead, which are typically less busy, or if your travel plans allow, ride midweek or midday when it’s less crowded. Follow @PacSurfliners on Twitter for train status alerts, including notifications regarding which trains we expect to be particularly busy. With an Unreserved Coach ticket, you can choose to take an earlier or later train at no charge if the one you were planning to take is expected to be crowded. If you are traveling between stations with luggage service, you can check your bags instead of carrying them with you. Stations are marked on the schedule with a suitcase. One of the best ways to enhance your travel experience is by upgrading to Business Class. You’ll have a guaranteed seat and extra space to stretch out, plus you’ll receive a complimentary snack and drink, priority boarding in San Diego, access to the Metropolitan Lounge at Los Angeles Union Station, and bonus Amtrak Guest Rewards points. The number of Business Class seats on each train is limited, so it’s best to book early before they sell out. Business Class tickets provide a seat on a specific train, so if you need to change your plans, call 1-800-USA-RAIL or go online to modify your reservation in advance. When a train is expected to be crowded based on historical trends, group reservations and ticket sales, we work to accommodate our passengers by adding extra seating whenever possible. During the Del Mar Racing season, we add an extra Café car to the busiest trains so it’s easier to purchase food and drinks, as well as an extra coach and Business Class car. For major events like Comic-Con, we added an extra roundtrip between Los Angeles and San Diego to accommodate the surge of travelers. Extra seating is being added to select trains to increase capacity, but some trains will still be very crowded between Los Angeles and San Diego. The table below shows the trains that we expect will be busier than others. Due to the nature of Unreserved Seating, this information is an estimate based on on projections, and is subject to change. View schedules for all trains here. *These trains are expected to be very busy. Note: Information above as of August 29, 2018. OH to LAX Wed, Aug 16, 10:05a. Quick Lunch & hug w/ niece in Santa Monica, planning for Business Class ticket(2) for PSL to SD for 4:30p +/- w luggage. how early to Union Station should we plan?? Thanks, tips were great. Amtrak recommends arriving to Los Angeles Union Station at least 45 minutes prior to departure, especially if you plan to check your bags. If it is your first time there, it’s always a good idea to give yourself a little extra time to find parking and find your way around the station. The Amtrak Station Agents are very helpful and can answer any questions you might have once you arrive. Feel welcome to let us know here if you have any other questions as well. We’re happy to help! Hi Trevor, sorry for the delay in responding to you. The size limit for carry-on bags is 28x22x11″ and up to 50 pounds. If you bring a bag over that size, you may be charged a $20 fee. But you should still be able to take it on, and it should fit in the luggage rack downstairs. Are you traveling to Old Town San Diego or Downtown San Diego? There is checked baggage service between Los Angeles (LAX) and San Diego (SAN). Sounds fun! From Chatsworth to Oceanside, the trip is a little more than three hours long. You can visit our website to explore the various options for departing and returning. As one example for a Friday, you can depart Chatsworth at 8:40 a.m. and arrive in Oceanside at 11:47 a.m. Returning from Oceanside, you can depart at 1:00 p.m. or 4:53 p.m. Have you ridden up to San Luis Obispo? It’s a longer trip (4 and a half hours from Chatsworth) but you’ll see pastures, coastal bluffs, and plenty of ocean views. 🙂 Also, don’t forget – kids ages 12 and younger ride half off every day! Is it possible to ride from orange county to san diego and back in one day? What is the latest return time from sd back to oc? Yes, it’s a nice day trip. It takes about 2 hours each way and there are beautiful ocean views. The last train (Train 595) departs San Diego at 8:52 p.m. Let us know if you have any other questions. Thank you! Planning a few days in San Diego, then a few days at Disney. If we have the time, may we get off the train and check out some of the stops along the route and get back on to complete our trip? I’ve made the trip before and the little surf towns along this route look like they’d be fun to walk around for an hour or two. Thanks! Hi Wyatt, you can certainly book your trip that way. With a multi-city ticket, you can book your trip in different segments. For example, San Diego to Oceanside, Oceanside to San Juan Capistrano, San Juan Capistrano to Anaheim, etc. You’d just need to plan your trip accordingly. Have you heard about our special promo with Disneyland? More info is available on our website!